You are about to enter a digital time capsule, an extraordinary collection of photographs taken on a single, ordinary day - Thursday, February 8, 1996. These images, captured by 1,000 professional and amateur photographers dispatched to every continent, record how the online world is changing our lives. No picture here is more then 24 hours older or younger than any other. And every photograph was shot for a single purpose: to document the harmonies and paradoxes of life in cyberspace as it was lived on this one day. 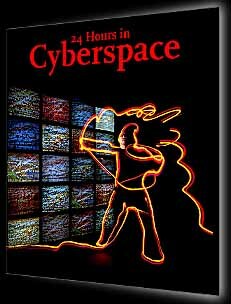 Cyberspace is no longer an abstraction: It is now the real world - the marketplace, the battleground, the house of prayer, the secret retreat. It is a place where we meet and where we venture alone. It's as comfortable and as boundless as the street where we live, as wondrous and frightening as the first day of kindergarten. We have yet to reach the borders of this brand-new place, and we may well discover that it has none. In fact, on the day this project took place, controversial legislation was passed that threatens the very freedom of speech the Net has come to nurture. There are hundreds of photographs on this website, selected from the more than 200,000 shot on February 8. But even 200,000 images barely hint at the infinite moments that passed through the hills and homes and hearts of humanity on that day. On February 8, 1996, cyberspace was frozen in time, and for decades to come, our children and our children's children will look with wonder at this photographic record of an ordinary day when millions of people around the planet took the time to paint their own names on the walls of the digital cave.